ԱՊՀ առաջնորդների հանդիպում Բիշքեկ, 2008. ↑ Decision on Turkmenistan's associate membership(չաշխատող հղում), CIS Executive Committee meeting in Kazan, Russia, 26 August 2005 (ռուս.). 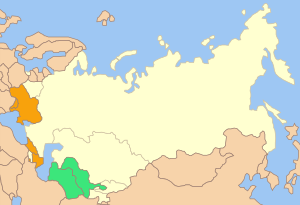 ↑ Turkmenistan reduces CIS ties to "Associate Member", Radio Free Europe/Radio Liberty, 29 August 2005. ↑ "CIS chiefs of staff want military integration." RIA Novosti, 3 December 2010. 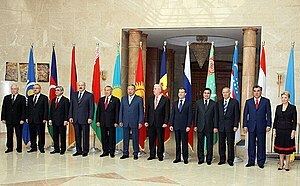 ↑ The Charter of the CSTO Archived 15 May 2011 at the Wayback Machine. ↑ “Rubezh 2008”: The First Large-Scale CSTO Military Exercise | PfP Information Management System (PIMS) Archived 18 February 2012 at the Wayback Machine. ↑ Alexander Yakovenko, the Spokesman of Russia's Ministry of Foreign Affairs, Answers a Russian Media Question Regarding International Observers' Conclusions on Election Results in Ukraine and Uzbekistan Archived 23 January 2009 at the Wayback Machine. ԱՊՀ գործադիր կոմիտեի պաշտոնական կայք.